Well, I went and did it! I pulled the trigger on my dream boat! Since I blew the last of the kids’ inheritance on the Tiffin Allegro 36LA, I’ve now indebted them to the hilt if I don’t get this sucker paid off prior to my demise! The means of returning it to the Pacific Northwest are under review. Should I just trailer it back here, or should I just go for the Grand Adventure? I can see myself cruising the entire Great Lakes chain, down the St. Lawrence and out into the Northern Atlantic, working my way down the East Coast, island hopping across the Caribbean to Panama, through the Canal, and back up the coast of Latin America and Mexico and the US West Coast to Puget… And then the danged alarm clock went off and I wasn’t dreaming any more. Bummer! There is no Sea Sport Pilot 2700 (or the new version Alaska Pilot 2600, for that matter!) in my future after all. So I guess I’ll just have to be satisfied with some lesser alternative. Over the past few years, besides researching motorhomes for The Journeys, I have been investigating boat options to assist with the “Catch a fish” portion of The Vision. Evaluation criteria included portability (weight, space requirements), capacity and capability, ease of deployment and recovery, and cost. Portability limitations pretty much excluded any hard-sided options. Towing the Jeep behind the motor home might make a car-top model feasible, but I’m afraid that I wouldn’t be able to man-handle it by myself. An inflatable would likely do the trick, but they’re pretty heavy as well, and they’d have to be inflated and deflated with each use. 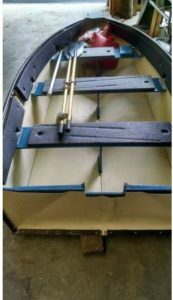 I was very skeptical of folding boats, but thought I’d at least check out that option. Last January, I finally accompanied friend Bob Funseth to the Puyallup Outdoor Show like he’d been bugging me to do for many years. While there, I checked out the Porta-Bote exhibit (check the video on the company’s web site). Although I was not favorably impressed with the sales rep, I was significantly impressed by the product. The model they had on display was the 10-ft model. I asked the sales guy to disassemble and fold it for me so I could get an idea of how it would be to handle by myself. He knocked that sucker down in about three minutes and at 78 pounds, I could definitely carry it and maneuver it onto and off of the roof rack of the Jeep. Perfect! The product comes in 8, 10, 12, and 14 foot models. The 8 foot model seemed too small, and the 12 and 14 foot models seemed to be too much for one person to handle easily. 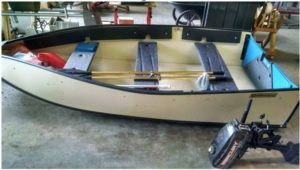 I’d originally considered purchasing a new Porta-Bote, but when I started adding up the cost of the boat and motor, we were looking at $4K+ and I didn’t want to spend that much. So in late May I started looking for used Porta-Botes. I saw a number of listings – there were typically 3-4 listed in the South-Central Puget Sound area at any one time in various sizes, but I was only interested in the 10-foot model. A couple of weeks ago, I saw 2 in particular that were of interest – one for $350 up in Cle Elum – about 90 minutes East of where I live, just on the other side of the Cascade Mountains, and a New-In-Box (NIB) offering in the Bellevue area for $1500. I went up to see the one in Cle Elum, but it was not in real good condition so that was a no-go. I was then going to go see the NIB offering, which was more than I’d wanted to pay ‘cause I’d still need a small motor, but which was about $1000 less than I’d have had to pay for it from the factory. Apparently someone else decided it was a good deal as well, because the listing had been pulled. Dang! On Monday, 6/27 after I returned from my daily treatment session in Seattle, Darling-Darling and I went over to Silverdale and met the gentleman at the new Harley-Davidson dealer there (closed on Mondays). He had it fully assembled in the back of his pickup. We unloaded it, inspected it, and I watched a video of him running the motor in a plastic garbage can earlier that morning. The boat looked good, with only minor normal wear and tear. The motor looked brand new. I figured that $1200 was definitely a fair price based on what I’d seen, so we shook hands on the deal and I headed for the local Alaska USA Credit Union branch in the local Safeway store to get the cash. I returned, paid the man and asked him to send me a Bill of Sale. We quickly disassembled the boat, folded and strapped it, and placed it on the top of the Jeep. 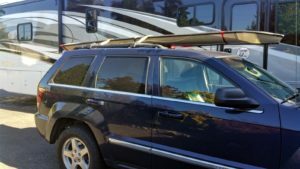 I jury-rigged a strapping system to hold it on the rack – gotta figure out a better, more reliable way to do that – and we took off for home. Arrived safely, unloaded the boat and accessories and carried them into the garage by myself with no problems. This thing is going to work just like I envisioned it! Now I gotta figure out a storage solution in the garage so I can get the Jeep back where it belongs and we’ll be ready – Let The Journeys Begin! that stows quite nicely on the roof rack! If you can get it up on a plane with 3.3hp motor, i’ll buy you a beer.